What is Decay? After the White Spot – The Hole! 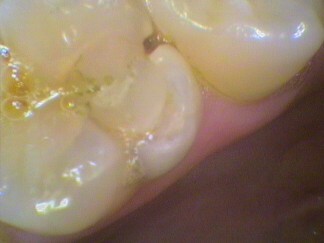 The white spot is the demineralisation of the enamel just below the surface. The surface is still intact but forever weakened. 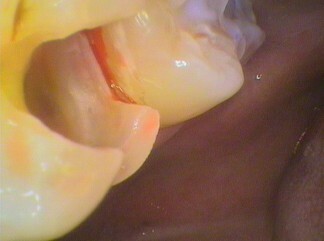 Prolonged exposure to plaque that produces organic acids, such as lactic acid, causes more demineralisation till the surface collapses and forms a CAVITY. At this point there may be no sensitivity; however, warning signs are food getting caught and finding difficulty in removing it. This may cause bleeding gums. Also after a while cold and hot sensitivity may occur intermittently. DO NOT IGNORE THE WARNING SIGNS. Once the surface collapses the next layer of the tooth, THE DENTINE, is exposed. Bacteria now can feed on this organic material directly. The acids cause the breakdown the structure of the dentine, releasing collagen and other organic compounds. The term decay describes the softening of the dentine. In reality the decay in the dentine comprises of two types of decay. 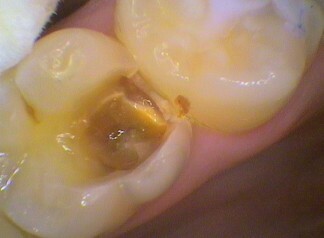 Infected decay contains bacteria in the broken down dentine. Affected decay is sterile of bacteria but has bacteria products, such lactic acid and enzymes, breaking down the dentine. This occurs ahead of the infected decay area. It is not as soft as infected decay. Just below the contact between teeth. Just above the gum line on the necks of the teeth. Under deep grooves or pits of teeth. Exposed dentine in worn areas from grinding of teeth or from over brushing. Fllings or crowns that are not smooth with the tooth- often called overhangs. A cavity in the next tooth causing bacteria to collect against the adjacent tooth surface. If left untreated the decay products and the exposure to the mouth causes the nerve (the pulp) to become inflamed. This is called PULPITIS. 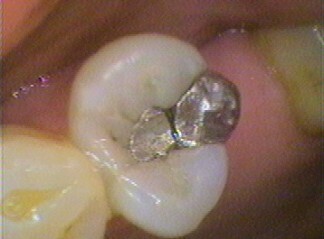 At this stage it is reversible if a filling is placed after the decay has been cleaned out. The larger the decay, the weaker the tooth will be for life. The flawed tooth, with usage, may cause cracks within the tooth structure. This may mean a crown is required to protect the tooth.